The type of siding or other building material you choose for the exterior of your home should accentuate the character and design of your home. For example, you wouldn't want to install vinyl siding on a Victorian home or an expensive wood siding on a beachfront home exposed to the elements of the sea. It can be expensive and time-consuming to replace or repair siding, costing anywhere from a few dollars to $30 or more per square foot. But if you choose a durable kind, you should save money on maintenance costs over time. The lifespan of various types of siding will depend on the climate where you live. Some types of siding can require periodic painting or restaining and, in the event of wild temperature swings, some types of siding can crack through expansion and contraction. Change the Appearance: New siding spruces up a home and increases its desirability. Increase Future Resale Value: New siding offers a benefit to buyers because it extends the life of a home's exterior. Lower Utility Bills: Adding insulation under siding provides a moisture barrier and prevents outside temperatures from disturbing the balance of interior climates. Decrease Maintenance Costs: A new paint job with high-quality paint might last 10 to 20 years. 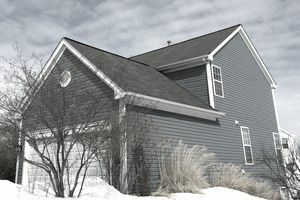 New types of siding require little, if any, maintenance. Brick can last a century. Because it's made from fired clay, brick doesn't burn and is not susceptible to dry rot. If brick isn't part of your original structure, adding brick is typically accomplished by installing a brick veneer, also known as brick face, rather than complete bricks. Maintenance of actual brick involves repointing—that is, replacing mortar in between the bricks. Mortar is a mixture of cement, water, lime, and sand. Stucco can be applied by a variety of methods, but hand-troweled is considered to be the best. It can be smooth, rough, or somewhere in between. Stucco needs to be watertight. If water seeps under the stucco, it will separate the material from the home. In a virgin application, stucco is spread over wire mesh, wood slats, paper, and sheathing. Drying in between coats is recommended. Re-stuccoing is permissible over original stucco. Vinyl siding made of PVC, or polyvinyl chloride, and comes in a variety of colors. The panels are installed from the bottom row up by nailing galvanized roofing nails through the slots in the panel, exposing the nail head so the panels can move. The vinyl expands and contracts in hot and cold weather and must slide freely from side to side. Two main advantages to vinyl are, it's inexpensive and never needs painting. It's hard to tell the differences between aluminum siding and vinyl siding without touching them as they look similar to each other. Aluminum siding became popular after World War II. However, the color can fade, and unlike vinyl, aluminum can get dented. It also expands and contracts, depending on temperature. Aluminum siding can be painted, and experts recommend oil-based paint over latex. Wood siding is manufactured in a variety of types such as shake, clapboard, singles, or lap. Panels are applied vertically or horizontally, and finishes range from stains to paint to sealants. Wood siding should be installed over a moisture barrier, and some contractors suggest priming the back of the wood and its sides to prevent water from seeping into the wood. Although wood is beautiful, it requires maintenance and can rot. Covering the exterior of your home with log siding can make it look like a log home without rebuilding the home. Log siding comes in quarter logs and half logs. The finishes are smooth, knotted, or, for that authentic log-home appearance, hand-hewn. Some log siding isn't even wood but resembles wood and is available in vinyl or steel. Common wood choices for log siding are pine or cedar. Glass block walls are non–load bearing. They are laid by installing panel anchors to the jambs, expansion strips around the opening, and panel reinforcing wire stabilizers every third or fourth row. Blocks are set into a special mortar made for glass. The maximum recommended size of a glass block wall is about 144 square feet. A glass block wall lets in light, but it does show interior shadows from the street. Routine exterior caulking is suggested. Manufactured siding can be created from almost any material and made to resemble natural wood. Some composite siding is made from shredded wood, binders, glue, and Portland cement. James Hardie is a well-known manufacturer of fiber-cement products—built to withstand rain, wind, hail, and insects—and this siding is available in a variety of colors, boasting a limited 50-year warranty. Stone has been used for centuries. Today's stone siding products are natural or simulated. Artificial stone faces are lighter and easier to install. Of all the siding options available, real stone siding is the most expensive. Most applications support a first layer, which is wall sheathing, covered by water-resistant paper, on top of which metal lath is secured. Then the stone is set into the mortar and laid.